Both the University of North Texas and its Health Science Center continue to make compelling headlines. Recently, UNTHSC announced that Dr. Thomas Yorio was awarded the 2014 Ernest H. Bárány Prize For Ocular Pharmacy Research, while two UNT students were chosen in February for the exclusive Exceptional Research Opportunities Program. Now, UNT has followed up with yet another major announcement concerning their research facilities on campus. 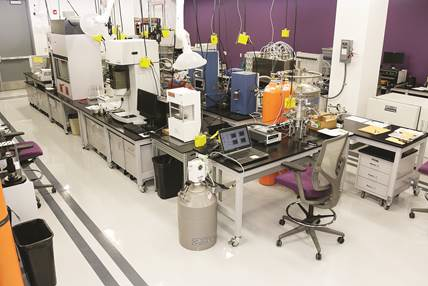 Engineering student and faculty researchers at the University of North Texas will soon have 30,000 square feet of new laboratory spaces full of cutting-edge equipment to make an impact through testing new byproducts and discovering new materials. The new spaces will be celebrated at a ribbon cutting event March 25th at the Discovery Park campus. The University of North Texas welcomes innovative-thinking students into their College of Engineering, where nine bachelor’s, six master’s, and two doctoral degree programs are offered. Their most recent addition of a biomedical engineering department brought the number of focus areas to six departments. Students are given the “green light” by the University of North Texas’s student-focused philosophy, world class faculty, and exceptional research facilities.